Inttelligent is let down by routine story and average direction. Lackluster music and not very good production values marred the decent work by the actors. The first half of the film is above average in entertainment, and the interval bang is okay in effect. 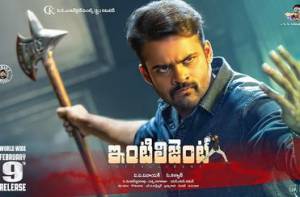 Few comedy scenes and Sai Dharam Tej remain the sole highlights of Inttelligent. Only hero cannot make a film hit and other departments have to be in sync. Inttelligent disappoints the star, his fans and movie lovers with its no novelty factor.